The flavour of this Konchu/Chemeen masala will make you crave for more and more , especially when you combine it with Tapioca/Kappa Tarts. 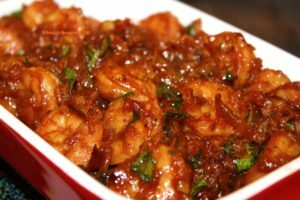 1.Clean and devein the prawns/shrimps. Marinate it with 1/4 tsp each of turmeric, chilly and pepper powder for half an hour. 2.Shallow fry the marinated prawns and keep aside. 3.Heat oil in a non-stick pan and fry onions, green chillies till the onions turn light brown. 4.Add crushed ginger-garlic and fry for 1 minute. Add the tomato paste and fry till oil separates. 5.Now add all the spice powders and fry till the aroma comes out. Add the fried prawns and cook on low flame for 5 minutes. 6.Garnish with chopped cilantro and serve hot as a side dish.